Centuries ago, people fasted for the entire Lenten Season not just on Ash Wednesday and Good Friday as the Church requires today. The fasting rules were not limiting the amount of food necessarily; but, refraining from eating any type of meat, eggs, all dairy items and any dish made with these ingredients for over 40 days. Therefore, on the day before Ash Wednesday many homes were making lavish meals to use up all their eggs, cheese, butter, and meats before the fast began the next day. As the Lenten Season was nearing an end, homes went into a flurry of activity as they prepared for Resurrection Sunday. People would start preparing all their favorite sweetbreads, desserts, and meats. Then on Holy Saturday they would gather all these items into a basket and take the foods to their local church to be blessed. Following Easter Sunday Mass, families would gather together to break the fast and share a holy meal of blessed food to celebrate the Risen Lord. Today, many families of all nationalities celebrate the tradition of The Blessing of the Easter Food. They realize that although our fasting rules are no longer as strict, Lent is still a time where we have we have offered our sacrifices to Jesus by improving ourselves in various ways. To break our fast with blessed food is a wonderful reminder that the Risen Lord made himself known to the Apostles many times during a meal. 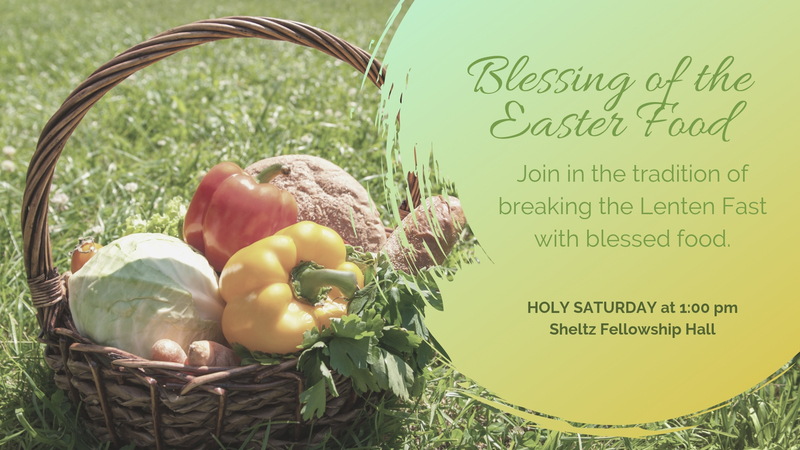 Join your parish family in blessing your own Easter Basket!